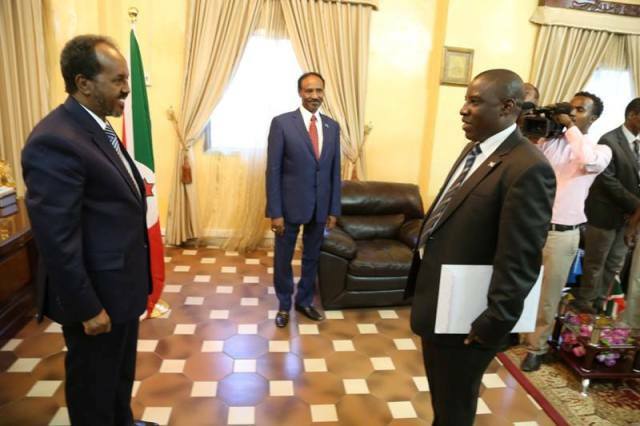 Djibouti (HAN) April 14, 2014 – Somali President Hassan Sheikh Mohamoud has received the credentials of new Burundi ambassador to Mogadishu Joseph Nkununziza. Mr Nkununziza presented his papers at Villa Somalia, the state house in Mogadishu. “The people of Burundi are our true brothers who have shed their blood to bring peace and stability in Somalia,” said the Somali leader. Mr Nkununziza, who was accompanied by Somalia’s Foreign minister Abdirahman Duale Baileh, pledged his country’s continued support to the ongoing efforts to stabilise Somalia. “We Burundians understand the importance of supporting a brother when he needs it most and that is why our soldiers are in Somalia,” he said. 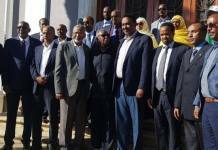 “Somalia deserves better and we urge the international community to provide timely resources to help the government to build its institutions in order to bring peace and stability. 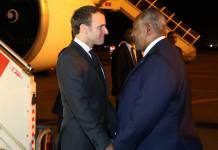 Burundi will increase its support to the government and the people of Somalia,” added Mr Nkununziza. “We are enormously appreciative of Burundi’s support in returning security to Somalia. Burundian soldiers are on the frontlines as part of (the African Union Mission in Somalia) Amisom, helping defeat Al-Shabaab,” the President stated. 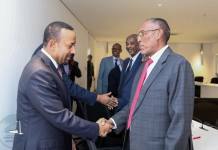 The President hoped that soon Somali soldiers would be able to ensure peace and stability throughout the country and take full control of the security situation. 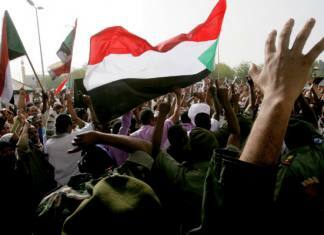 “That will only be possible with the assistance of our brother nations like Burundi,” remarked President Mohamoud. Burundi alongside Uganda, Kenya, Ethiopia, Djibouti and Sierra Leone has contributed thousands of peacekeepers trying to stabilise the Horn of Africa country after more than two decades of civil conflict. In recent military campaigns, Amisom peacekeepers drove Al-Shabaab fighters out of 10 districts in Southern and Central Somalia, weakening the al-Qaeda-linked movement. On Sunday, President Mohamoud received in his office the new ambassador from the United Arab Emirates (UAE) Mr Mohamed Al-Othman. “We appreciate the Emirates’ role in assisting Somalia in its stabilisation and development efforts,” said the President. The Burundi contingent is the second largest within AMISOM with 5,432 troops. The country was also the second to deploy troops into Somalia, its first soldiers having arrived in Mogadishu in December 2007. Based in Baidoa and commanded by Col. Jean Luc Habarugira, the contingent is primarily responsible for operations in Sector 3, which covers Bay and Bakool regions but also maintains troops in Sector 1 where they work closely with the Ugandan forces. Burundi has so far sent six battle groups in Somalia and has provided three Deputy Force Commanders. Lt. General Silas Ntigurirwa from Burundi is the AMISOM Force Commander. He recently took the command of mission from Lt. Gen. Andrew Gutti from Uganda.